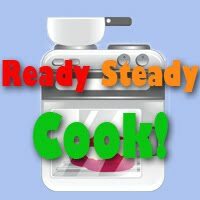 A while back I hosted a very successful Ready Steady Cook competition on my blog. I had a lot of fun hosting it but because I had offered prizes there was no way I could take part. That’s why I farmed out my idea to anyone willing to bite so that I could have a chance to cook in it myself. Tandy over at Lavender & Lime was quick to offer her blog as host and after a few false starts away we went.